Joe’s a regular here at Love That’s Out Of This World, and if I must confess to having favourites, then yeah. Joe’s mine. He always has something interesting to say to begin with, and he’s led such an interesting life that I’m always delighted when he comes here to share some of it with us. And when he says “Mind if I come along and talk about when I used to be an actor, and how I use that to commit murder… so to speak?”, then I just hold out ‘gimme’ grabby hands. So here he is. Talking about murder, and acting, and the latest mystery starring Nicky and Noah. I mean, who can resist a film title like When the Wind Blows Up Your Kilt It’s Time for A Scotch. Not me. I am definitely a drama queen. Not only do I become emotional at the drop of a jack strap, but after majoring in drama (in more ways than one) at college, I acted opposite stars like Rosie O’Donnell (AT&T industrial), Nathan Lane (Roar of the Greasepaint musical onstage), Bruce Willis (A Midsummer Night’s Dream onstage), Charles Keating (NBC’s Another World), Jason Robards (Commercial Credit computer commercial), and Holland Taylor (ABC’s My Mother Was Never a Kid TV movie). When the Academy Award statue didn’t appear at my doorstep, I moved on to become a college theatre professor. I used all of those experiences in writing the Nicky and Noah mysteries, where the settings are warm and cozy, the clues and murders (and laughs) come fast and furious, and there are enough plot twists and turns and a surprise ending to keep the pages turning faster than a conservative politician taking away people’s health insurance (as Nicky would say). At the center is the touching relationship between Associate Professor of Directing Nicky Abbondanza and Assistant Professor of Acting Noah Oliver. We watch them go from courting to marrying to adopting a child, all the while head over heels in love with each other (as we fall in love with them). 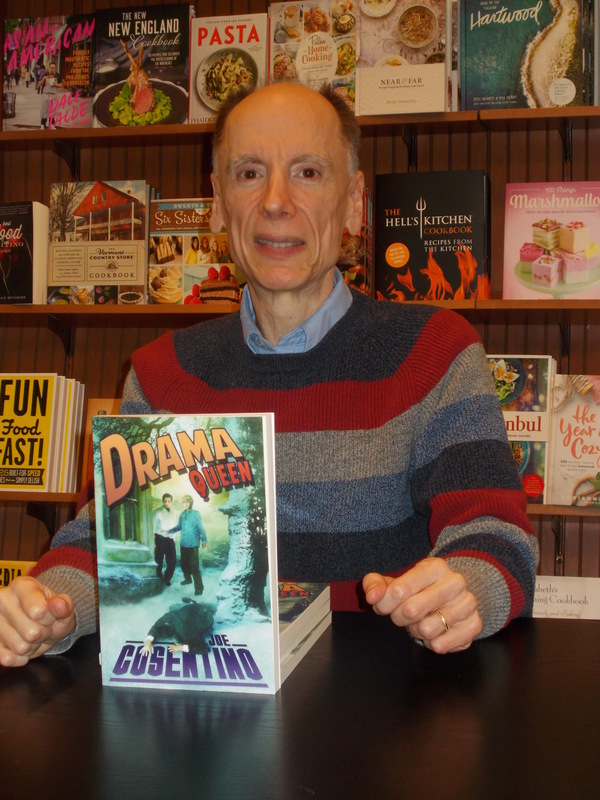 In Drama Queen (Divine Magazine’s Readers’ Choice Award for Favorite LGBT Mystery, Humorous, and Contemporary Novel of the Year) Nicky directs the school play at Treemeadow College—which is named after its gay founders, Tree and Meadow. Theatre professors drop like stage curtains, and Nicky and Noah have to use their theatre skills, including impersonating other people, to figure out whodunit. In Drama Muscle (Rainbow Award Honorable Mention) Nicky and Noah don their gay Holmes and Watson personas again to find out why bodybuilding students and professors in Nicky’s bodybuilding competition at Treemeadow are dropping faster than barbells. In Drama Cruise it is summer on a ten-day cruise from San Francisco to Alaska and back. Nicky and Noah must figure out why college theatre professors are dropping like life rafts as Nicky directs a murder mystery dinner theatre show onboard ship starring Noah and other college theatre professors from across the US. Complicating matters are their both sets of wacky parents who want to embark on all the activities on and off the boat with the handsome couple. In Drama Luau, Nicky is directing the luau show at the Maui Mist Resort and he and Noah need to figure out why muscular Hawaiian hula dancers are dropping like grass skirts. Their department head/best friend and his husband, Martin and Ruben, are along for the bumpy tropical ride. In Drama Detective, Nicky is directing and ultimately co-starring with his husband Noah as Holmes and Watson in a new musical Sherlock Holmes play at Treemeadow College prior to Broadway. Martin and Ruben, their sassy office assistant Shayla, Nicky’s brother Tony, and Nicky and Noah’s son Taavi are also in the cast. Of course, dead bodies begin falling over like hammy actors at a curtain call. Once again Nicky and Noah use their drama skills to figure out who is lowering the street lamps on the actors before the handsome couple get half-baked on Baker Street. In Drama Fraternity, Nicky is directing Tight End Scream Queen, a slasher movie filmed at Treemeadow College’s football fraternity house, co-starring Noah, Taavi, and Martin. Rounding out the cast are members of Treemeadow’s Christian football players’ fraternity along with two hunky screen stars. When the jammer, wide receiver, and more begin fading out with their scenes, Nicky and Noah once again need to use their drama skills to figure out who is sending young hunky actors to the cutting room floor before Nicky and Noah hit the final reel. Now in Drama Castle, Nicky is directing a historical film co-starring Noah and Taavi at Conall Castle in Scotland: When the Wind Blows Up Your Kilt It’s Time for A Scotch. Rounding out the cast are members of the mysterious Conall family who own the castle. When hunky men in kilts topple off the drawbridge and into the moat, it’s up to Nicky and Noah to use their acting skills to figure out whodunit before Nicky and Noah land in the dungeon. Nicky and Noah are joined by their best friends and fan favorites Martin and Ruben, and by Noah’s eccentric parents. And book seven adds a number of captivating new characters like Brody Naughton, the hunky head of Housekeeping with a red beard and roving eye for the oldest Conall brother, Barclay, and for Donal Blair a waiter in the castle’s Great Hall dining room. Each of the three hunky Conall brothers (Barclay, Magnus, and Fergus) have a surprising secret, and Noah makes a shocking personal revelation. Previous Don Travis and Abaddon’s Locusts – with Giveaway! Next J. Scott Coatsworth’s “Ithani” published today – with a giveaway!